All About You... "Believe" Weekend Retreat was a big success! Julie's Believe retreat really got me motivated to keep up with fitness, especially as the winter months approach. 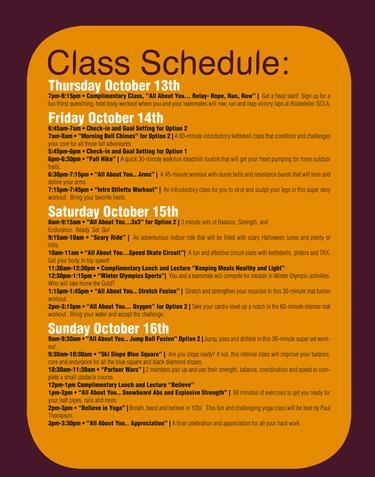 There was such a variety of cardio and strength classes, and the seasonal themes and music kept everything fun! Julie's workouts are so thoughtful and inspiring, and she's so great at encouraging us to set individual goals and to stay motivated by tracking our progress. After a few months of working out on my own and falling into a routine, Julie's retreat got me excited again about fitness and achieving my fitness goals. Thanks for another great retreat! "Julie is the hardest working person I know and this weekend was no different. Every second of the weekend was well planned, creative, motivating and executed flawlessly. I came into the weekend not sure that I would be able to complete all three days, especially recovering from a knee injury, but Julie had prepared in advance modifications to all the exercises just for my knee situation and provided constant encouragement to everyone and we all finished! In summary, Julie's weekend retreat was phenomenal- she definitely made a 'believer' out of me!" It's back and I could never be more excited. This weekend is going to be sooo much fun. Review the details in the flyer and sign up today. Space is limited and non members are welcome. So, ask your friend, workout buddy to join you for the weekend. There's 2 options to choose from. Level 1 is 10 classes and Level 2 is 14. Goodie Bags are being assembled now. Currently the value is $324 and I hope to double it. More details to come on this.. so it's well worth your money and our body desires it!! !